This locally-made flogger features soft maroon deerhide falls with a purple/black dymondwood handle. The end of the handle also features a metallic decorative emblem. Total length is 29", handle length is 11". 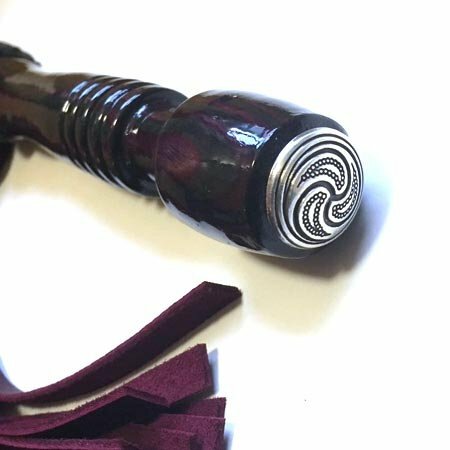 Katana Works creates beautiful floggers that are perfectly balanced and gorgeous to look at, featuring uniquely designed handles fashioned from multi-colored dymondwood or exotic hardwoods. These are fantastic items produced by a local craftsman, and we're excited to offer them at the Tool Shed! This flogger features soft maroon deerhide falls with a purple/black dymondwood handle. The end of the handle also features a metallic decorative emblem. Total length is 29", handle length is 11".